University of Kent Special Collections hold two significant collections of material about the playwright and actor Dionysius Lardner Boucicault (1820-1890), better known as Dion Boucicault. 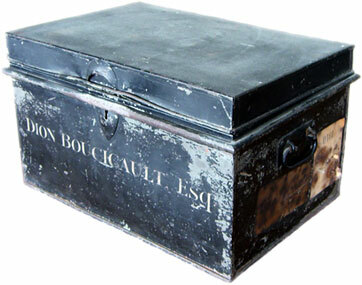 This is a collection of ca 750 items, principally consisting of the research notes of Richard Fawkes for his book Dion Boucicault: a Biography (1979). The collection also contains photocopied playbills and letters, rough drafts of the book, and photographs and other image material. This is larger and more important than the Fawkes Collection. It was compiled by Christopher Calthrop, Dion Boucicault's great-grandson. The material on Boucicault's plays and the biographical material have been catalogued. Uncatalogued material includes a large number of legal documents, letters, and material on later members of the family, eg Nina Boucicault, the first actor to play Peter Pan on stage, and Donald Calthrop, a character actor in films of the 1920s and 30s. Dion Boucicault manuscripts and printed play texts are also included in the Pettingell Collection.